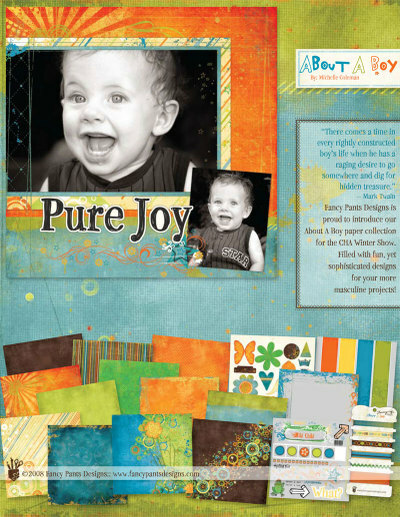 Introducing 2 of our 6 new lines..."
About A Boy" and "Simplicity". 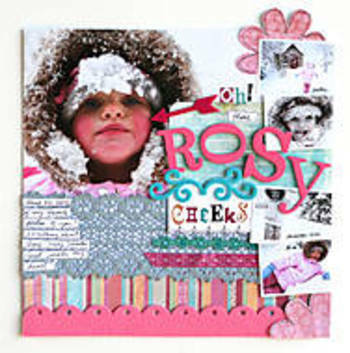 Here is the beginning of our CHA Winter Sneak Peeks! You may have seen these in our recent ads..but if you haven't, you are in for a treat!! Each line is complete with 6 double sided papers, rubons, ribbon, titles & tags, and now transparencies to match each of the new lines!!! Remember, this is just the beginning! This is a busy time for Fancy Pants Designs, and we have so much more we are excited to show you---as we said before, this is our biggest release yet!!! We have been very busy around here......with the NEW CHA RELEASES! Keep checking in during the week for SNEAK PEEKS of the new product that will be released at the CHA Winter Show---You do not want to miss this release, it is our BIGGEST yet! Fancy Pants Designs would like to wish everyone a very Happy New Year!!! Where has the year gone?! We are excited for the new year, and can't wait to show everyone what new ideas and designs we have in store!! Below is a layout by Amy Peterman using the Botanical line, Fashion Sense Sassy felt, chipboard, ribbon, creative cards, rubons and lace wraps. 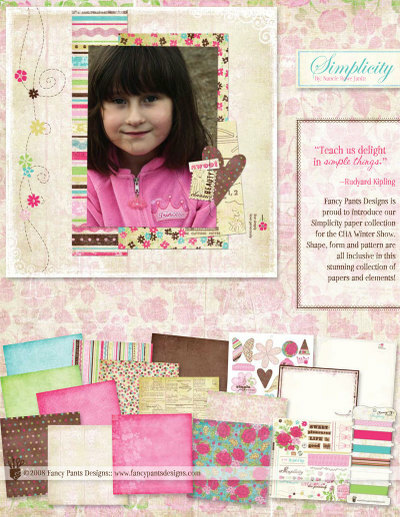 We love this layout because it uses so much of our great product lines! Come check out our Idea Gallery for more fabulous ideas from our great Design Team! Here is the link: www.fancypantsde signs.com/gallery/.